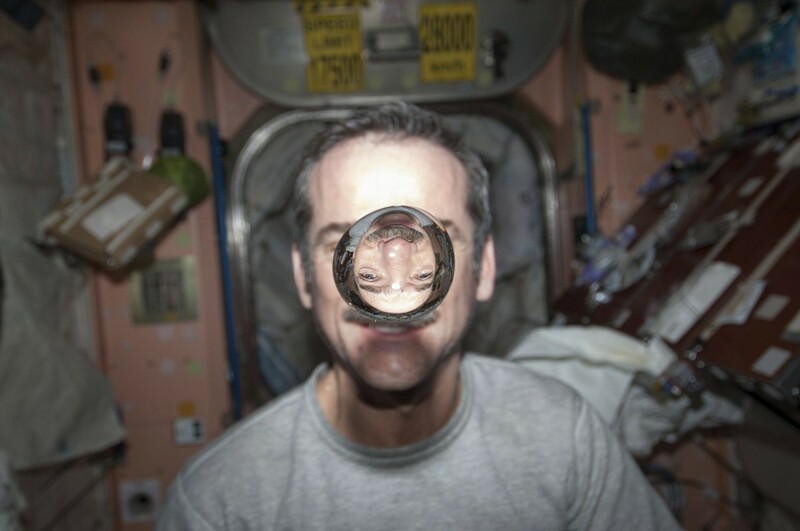 Blog post How do humans breathe in space? Humans can only live comfortably in a small variety of places. We can’t live underwater. Or higher than a certain altitude, where there is too little oxygen. We can only live in a very small slice of the atmosphere, from sea level up to 3-4000 m. If you think about it, the human habitable zone is really tiny, especially when compared to how big the universe is. Yet, we can fly on planes at much higher altitudes, survive underwater for months at a time in a submarine and at any moment there are one or more scientists aboard the International Space Station (ISS), orbiting the earth at an altitude of 370 km and at a speed of 28000 kilometres per hour. Places that our frail biological body is not meant to handle. First of all, let’s have a look at what humans need to survive. We have evolved to breathe the earth’s atmosphere, a mixture of various gases. Surprisingly, even though it is vital, oxygen does not make up the majority of the atmosphere, nitrogen does. Air is approximately 78% nitrogen, an inert gas. Oxygen makes up 21% and various other gases, like carbon dioxide, methane and argon make up the rest together with water vapour (which is usually around 1%). In fact, oxygen at higher concentrations becomes poisonous, and outside specific circumstances, it is better to give humans the right mixture of gases. When humans breathe, oxygen from the air is transferred to the blood stream from the lungs. It is then used by cells (more specifically mitochondria) in the metabolic reactions which are how we get the energy needed to be alive. Without oxygen, these reactions would not be possible, and we would die. Carbon dioxide is produced in this process, carried to the lungs by red blood cells and breathed out. But of course, humans don’t just need the right mix of gases to breathe, these gases also need to be at a reasonable temperature and pressure. Breathing in air at 40 degrees below zero will not do you any good. Humidity (the amount of water vapour in the air) is also important. Humans use evaporating water (sweat) as the main method of temperature control and at high humidities we sweat less. Humidity has an effect on the perceived temperature. At high humidities many people have trouble breathing, and very dry air is almost as uncomfortable. Therefore, to create a breathable environment, we need to recreate the atmospheric conditions that humans are used to as much as possible. Compared to submarines and space craft, planes have it easy. Sure, at the altitudes where modern planes cruise, 11000 metres above sea level, the air temperature is 56 degrees below zero, at less than a quarter the pressure at sea level and its oxygen content is 25% of sea level, but at least you have access to it. Of course, it’s not ideal for human survival and all planes that fly at altitudes higher than 3-4000 metres need to have a pressurised cabin. The temperature of the cabin has to be significantly higher as well, humans don’t survive for very long at -56 C.
If the cabin was not pressurised the passengers would experience extreme hypoxia (lack of oxygen). They’d feel dizzy, slur their speech, eventually pass out and ultimately die. They’d also get altitude sickness. The automatic response to lack of oxygen is to hyperventilate (breathing deeper and faster than normal). While this helps a little, it also causes more carbon dioxide to leave the body which increases the alkalinity of the blood, which can cause all sorts of problems. Because the pressure is so low, some gases that are normally dissolved in the bloodstream can form bubbles (embolisms), which can cause a lot of issues. They are very painful and can be fatal. It’s the same problem divers face when surfacing too quickly, the ‘bends’. How do engineers solve this problem? With a (very advanced) air conditioner. Similar to the ones that you have at home, but much more powerful. In fact, the air is cooled before being fed into the cabin. Hang on, you just said that the air is really cold. Shouldn’t you warm it up instead? Well, actually, the most commonly used air is bleed air. Bleed air is air taken from inside the plane’s jet engine, more specifically from the compressor stage. I don’t want to get into exactly how a plane engine works (that would take a another whole post, at least), but basically the air enters the front of the jet engine, is compressed, fuel is added and burned in the combustion chamber, and a turbine transforms this energy into propulsive energy (which is what pushes the plane forward). During the compression stage the air is very hot and at a very high pressure but not yet full of fuel or exhaust gases. This air is bled from the engine (extracted through a small opening), then diffused and cooled using the cold outside air (through a heat exchanger). This keeps the cabin nice and warm, and pressurised. However, this air is quite dry. Fortunately, planes have onboard several hundreds of natural humidifiers: humans. As we sweat and breathe out water vapour, the water content in the cabin increases. The air system on the plane will mix the old cabin air with the bleed air to keep the humidity in the cabin at reasonable levels. It’s incredible to think that all this technology allows us to sit on a chair, on a flying metal bird, over 10 km up in the sky, travelling at 900 km/h, with the same comfort as sitting in your living room (unless you travel with Ryanair). What if you don’t have access to air? As I said previously, planes have it easy. What if you’re on a submarine, scheduled to stay several months under water without surfacing or on a space station? You can’t easily get fresh air. So you have to make your own. A very common way of producing oxygen is through electrolysis. Electrolysis uses a direct current to split water molecules (H2O) into molecules of oxygen and hydrogen. On board the International Space Station there are two modules that generate oxygen with this method. The Oxygen Generator System is US-built and was activated in 2007. Another, russian-built, is called Elektron and was also used on the Mir space station. The generated hydrogen gas is vented to space, while the oxygen is kept inside the station. The water is taken from the water vapour in the air and also from recycling urine. Oxygen can also be made chemically. 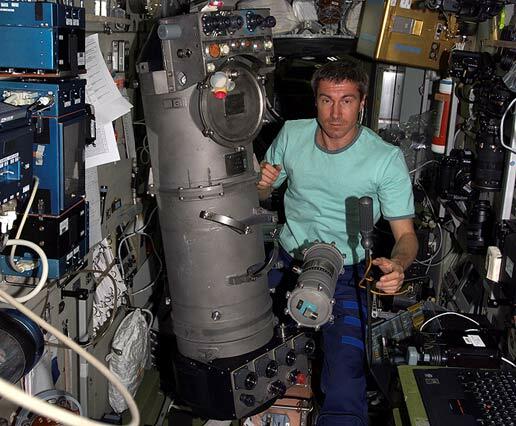 On the ISS the Vika oxygen generator is a backup system that uses a solid fuel (lithium perclorate). A chemical reaction can be initiated to create oxygen. Together with a system that controls the humidity and pressure, these keep the atmosphere on board the ISS to the same conditions as found at sea-level down here on earth. Of course, they also have tanks of oxygen that they use when the generators break down or when they need maintenance. In fact, chemical oxygen generators are also used on planes. When there is a sudden depressurization of the cabin, oxygen masks drop down from above the passengers. When the passenger tugs on the oxygen mask to put it on, a pin is removed from a container of various chemicals. This triggers a reaction that produces oxygen. Oxygen is generated in the same way on submarines. On the ISS the Carbon Dioxide Removal Assembly scrubs CO2 from the station’s atmosphere and vents it to space. Similar CO2 scrubbing systems are in place on submarines. Air is passed through beds of soda lime or similar chemicals. A chemical reaction traps the carbon dioxide inside these chemicals. Activated charcoal scrubbers are also used. Activated charcoal is charcoal that has been processed to have lots of tiny pores. These tiny pores increase its surface area and as air containing CO2 is passed on a bed of this material, the carbon dioxide is absorbed. Other substances rich in carbon (like methane or other hydrocarbons) are also absorbed. We need to recreate conditions similar to that of the surface of the earth and it is only with all of these technological advancements that we are able to survive in such ‘unnatural’ conditions. After all, humans have evolved to live down here, not out there outside the atmosphere or below the surface of the ocean. It is really quite impressive that, as a species, we have managed to bend the harsh reality of nature to our will. Liked the article? Want more information or clarification? Do leave us a comment. Elwood H. Hunt, Dr. Don H. Reid,. David R. Space, and Dr. Fred E Tilton (2005) – Commercial Airliner Environmental Control System. Engineering Aspects of Cabin Air Quality. Yunchang Zhang, Girish Kshirsagar, and James C. Cannon (1993) – “Functions of Barium Peroxide in Sodium Chlorate Chemical Oxygen” – Ind. Eng. Chem. Res. What technological challenges do we face when recreating the appropriate breathing conditions in extra-ordinary circumstances? What do humans need to survive and how can we provide it? Quali sfide scientifiche dobbiamo affrontare per ricreare le condizioni ottimali per la respirazione umana in circostanze straordinarie? Di cosa hanno bisogno gli uomini per sopravvivere e come possiamo fornirlo? Quels defis scientifiques devons nous confronter afin de recreer les conditions optimales pour la respiration humaine dans des circostances extraordinaires ? De quoi ont les hommes besoin afin de survivre et comment pouvons nous le fournir? I thought it was a very clear article for my Biology students in grade 9 to understand how humans survive in different habitats.